(Fox News and Commentary Todd Starnes) A controversy is brewing over whether the United States might break tradition and dip the American flag at the opening ceremony for the London Olympics. However, the American Legion said to do so would not only violate the U.S. Flag Code, but would also be un-American. Scott Blackmun, the CEO of the United States Olympic Committee, told Reuters they were discussing the matter internally. But Mike Buss, deputy director of the American Legion, said it is a very big issue. He said he believes dipping the American flag at tonight’s ceremony would be un-American. There is no policy that obligates the flag bearer to dip or not dip the flag, a USOC spokesman told the New York Times at a London press conference. Buss said it’s the law – federal law – although there are no civil penalties for breaching flag etiquette. It’s not the first time the USOC has courted controversy over American patriotism. The revelation that the USA’s Olympic uniforms were made in China led to widespread and bipartisan outrage. “The U.S. Olympic Committee was 100 percent wrong to outsource the manufacturing of U.S. uniforms for the opening ceremony to China,” Sen. Bob Casey (D-PA) told the LA Times. Fencer Mariel Zagunis was selected to lead the 529-member U.S. team into Olympic Stadium. She told Reuters that she was aware of the tradition of not dipping the American flag. The New York Times reported that she appeared “flummoxed” when asked at a press conference about her intentions. 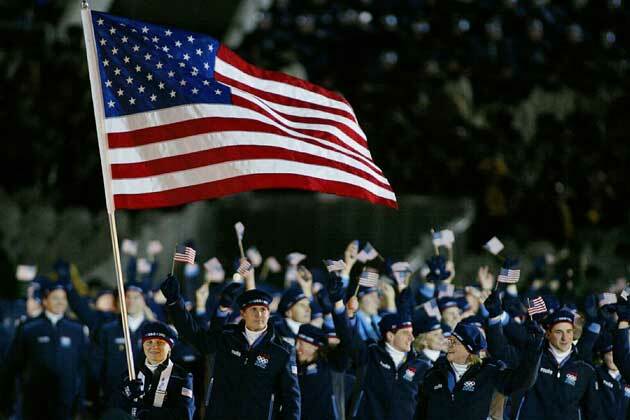 The tradition of not dipping the flag can be traced back to shotputter Ralph Rose. Historians said he refused to dip Old Glory during the 1908 Summer Games in London. “This flag dips for no earthly king,” he reportedly said. The United States stopped dipping the flag at the opening ceremony in Berlin in 1936.